Islamabad is the capital of Pakistan and has a population of about 1 210 000 people. It is the tenth largest city in the country and was built in 1960 to replace Karachi as Pakistan's capital. It is considered the most developed city in the country. Islamabad is on an area of nine hundred and six square kilometers. The microclimate of Islamabad is regulated by three ponds: Rawal, Simli and Khanpur. In the city is located Faisal Mosque, which is the largest mosque in South Asia and the sixth largest mosque in the world. Excavations in the vicinity of Islamabad have revealed many artifacts from prehistoric culture. There are human skulls dating back five thousand years BC. The area around the city of Islamabad today is the first place of abode of the Aryan communities in Central Asia. Their civilization flourished in the area during the twenty-third to the eighteenth century BC. Many of the largest armies, such as that of Alexander of Macedonia and Genghis Khan Islamabad used it as a corridor towards the Indian subcontinent. The modern city of Islamabad was built on the foundations of an old settlement known as Saidpur. In 1947, Karachi was Pakistan's first capital. In 1960 Islamabad was constructed for several reasons. Developments in Pakistan are focused on the colonial center of Karachi. President Ayub Khan wished it to be evenly distributed in the country. Another reason for choosing Islamabad as the capital is that Karachi is located in a place vulnerable to attacks from the Arabian Sea. In 1958, a committee to select a suitable site for the capital of the country, focusing on climate, logistics, location and defense was made. After a long and accurate study, the committee recommended the northeast area of Rawalpindi. The capital was not moved immediately to Islamabad, it was moved temporarily to Rawalpindi. 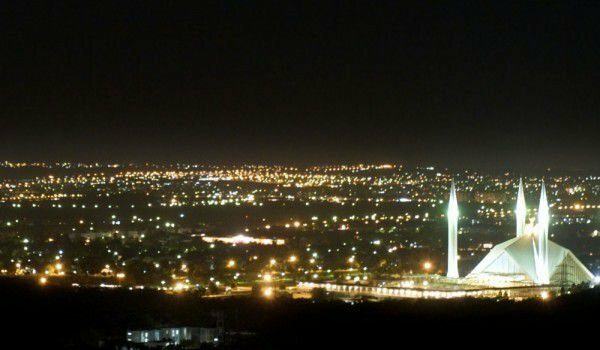 After completion of Islamabad, the city attracts people from all over Pakistan, making it the most cosmopolitan city in the country. Islamabad experienced a series of terrorist incidents, including the siege of Lal Masjid in 2007. In July 2010 an aircraft of Pakistan’s Air Blue crashed into Margalla Hills, near the town, all one hundred and fifty two people on board - crew and passengers – were unable to escape. Islamabad architecture is a combination of modernity and old Islamic and regional traditions. Saudi Pak Tower is an example of integration of modern architecture with traditional architectural style. The beige building is decorated with blue tiles in Islamic tradition and is one of the tallest buildings in Islamabad. Another example of the interweaving of Islamic architecture with modern style is Faisal Mosque. The design of the mosque is a symbiosis of modern architecture with traditional large triangular rooms and four minarets. The architecture of the mosque is unusual because there is no dome. Islamabad is home to many immigrants from other regions in Pakistan. Thousands of pilgrims from all over Pakistan attended the annual Urs of Bari Imam. The event is one of the largest religious gatherings in Islamabad.